24 years ago Nisha and Malkit Dadi founded their unique jewellery design brand, Kyles, named for the beautiful countryside surrounding their then home in the Scottish Kyles of Bute. What began as a small family business, custom-making ornate pieces of jewellery and “fusion jewels”, has led to a London-based flagship boutique and international success for the pair. Over the years, as their business has expanded, they have received numerous awards and accolades, not to mention royal invitations and celebrity endorsements from the likes of Nina Wadia and Missy D.
The resounding success of Kyles is unsurprising when you cast an appraising eye over their wares. 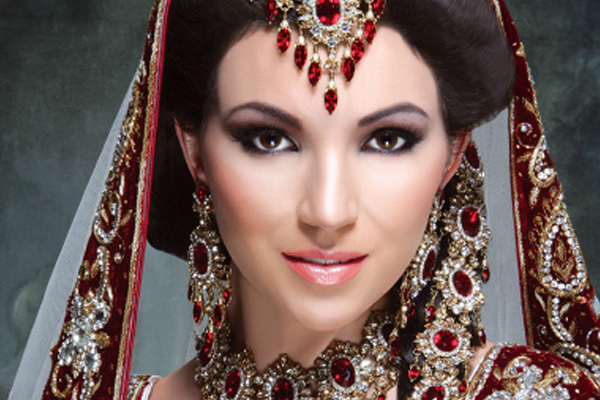 The company produces an impressive selection of jewellery collections including high fashion and bridal jewellery, and their skilled designers use Swarovski crystals and a variety of plating metals to create uniquely beautiful pieces which seamlessly blend Eastern and Western fashions. When it comes to bridal jewellery, a highly popular and integral market, they have both a traditional and contemporary selection to appeal to differing tastes. The traditional range includes all of the dramatic, heavy pieces people tend to associate with Asian – and particularly Indian – weddings, such as the large gold hair ornaments, nose adornments known as “naths” and ornate head pieces, while the contemporary selection features more Westernised items, though still flaunting an exotic Asian flair. The Mists of Time set is particularly romantic, with its elegant pendant and matching bangle and hair comb, though you can also mix and match by substituting a choker for the necklace and both drop and stud earrings are available. Kyles also produce a stunning selection of “party-wear” pieces, perfect for a glamorous night out or an outrageous party. The bold and dramatic Cleopatra Sareen set is particularly chic and comes in crystal, gold, blue zircon or pink hues while the Pearlised Mimosa Set is a delectable creation of crystals, beads and faux cream pearls and includes a chunky necklace, bracelet and floral punja. Male consumers are not neglected when it comes to Kyles’ wedding jewellery. Bridegrooms can choose between the Sultan, Veeraj and Ranja sets which include turbans, rings and shoulder pieces for that bit of added sparkle. If you are shopping for more casual pieces, the company offers a selection of hijab scarf pins for fashionable Muslim women as well as glittering Pianello hair combs and a Mariano hair selection which boasts among its items gold plated combs adorned with light smoked topaz and crystals. All Kyles’ jewellery products are hand crafted in their London boutique and come with a year-long manufacturer’s guarantee. The company’s prices are not exorbitant, though bridal sets can set you back over £700, but when you take into account the effort and artistry which goes into creating the jewellery these kinds of price tags are to be expected. They offer a bespoke bridal service as well as a VIP experience and recently attended the Asiana Bridal Show London 2014 which was held at the Park Plaza Riverbank Hotel and included 100 of the UK’s top wedding service suppliers.